Stash Report week 34, 2013. I'm currently sitting in our trailer, in a Canadian Tire parking lot, while Scott goes in to get some citronella candles for bug repelling when we get to our campsite. We're on our way to Awenda provincial park for a week's vacation. There will be lots of relaxing and lots of knitting and stitching and at least one visit with Avery. I am, once again, loving our new trailer. It is so nice to be able to pull over, and go into the trailer, and be able to access the food and the fridge, and have lunch, rather than having to spend money on eating out. Gail had a second annual Mad About Patchwork fabric party this past Thursday evening, with a percentage of the proceeds going to the charity quilts section of her St Thomas quilting guild. I, of course, had to get some fabric, since I wanted to support that very worthy charitable cause. But I didn't go overboard. I purchased some light neutral fat quarters, and six yards of Kona white, which will very shortly have a quilt to go into. Balance: 95.2 more yards in than out. I'm linking up to Judy's Stash Report and then I'm going to sit back and enjoy the lovely day and drive, while knitting on a pair of socks. I think I'm starting to get the same affliction with knitting that I have with quilting.... too many projects going at once. And I'm not sure, at the moment, that I even know where they all are. I have a pair of socks going, no picture because they are currently buried under something. I have a sweater going, and a really fun and cute scarf/hat/balaclava for Avery. I'm combining 2 patterns for this one, both of them free downloads from Ravelry. The bottom of it is from this pattern Hat in Alpaca I'm hoping that it will substitute for a separate scarf for him. And the the rest of it is from The Bunny Toddler Balaclava I like the way that one has the ability to cover the mouth and nose, and have a section that comes down further on the forehead. And the bunny ears are just so cute. And then today, I made my second attempt at the Dreambird Shawl I tried it yesterday, and messed up somewhere, so ended up ripping it out. So today, after doing up the rest of the tomatoes and getting 5 more quart sized jars, I sat outside and started attempt number 2. The first time, I just went by the written instructions, which didn't work out very well, so today I combined the written instructions for the how-to, with the line counts for the exact numbers, and it worked. I have one feather done. It's hard to tell, at the moment, how well the 2 yarn colours are going to contrast. They both have grey tones in them, but I'm committed now. And the backdrop to Dreambird is the pile of my 4 completed blocks to Road to Brenham. I'm starting to put together some of the other blocks, as well, so that I'll have some done and won't be quite so far behind when we get back from vacation. I'm linking up to Judy's On the Needles There are more Dreambird Shawls to see there. I've loaded a new quilt today. This is a sampler pieced by Maureen. It is quite lovely. It is getting done with light custom quilting with lots of continuous curves. Do I really need a new project???? aren't quite right in this picture. The reds are more burgundy than it shows here. The really cool thing about this project, though, is that it is a group thing. We cast on our stitches on Sunday. Judy, at Patchwork Times, who manages to talk me into a lot of things, considering we've never even met, is hosting this knit along, and today we are to show our yarn choices. So, I'm linking up to the yarn choices post. Then, I have to talk my human yarn swift, aka, dear husband, into helping me get this hank of yarn into a ball of yarn. There is nothing on my design wall today, zero, zip, zilch. I haven't even been up there today. These jars here are the reason there is nothing on my wall, because there are 3 quarts of tomatoes and 5 pints of peaches on the counter, and 6 more pints of peaches in the water bath canner. Does it ever smell good in here. And I am so glad that our kitchen is here in the basement, rather than upstairs. It's so much cooler to do this kind of thing down here. I still have tomatoes that aren't ripe enough to process, and peaches as well, that aren't ripe enough yet. So I'll be doing this again later on this week. kitchen. 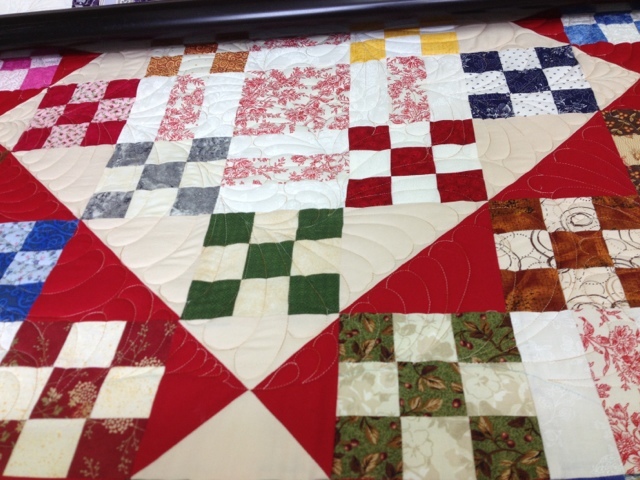 I'm working on step 4 of Judy's Road to Brenham quilt along, and actually have it all done. So far, I'm keeping up. Whether I remain caught up remains to be seen. We're going away in the trailer next week, so I don't know if I'll take anything like this with me. the chances of getting a hydro site are pretty slim, if we want to stay over the long weekend. And even if I do take it with me, there is no internet signal at the campground we'll be at, so I won't be able to get the instructions, even if I do take my machine with me. 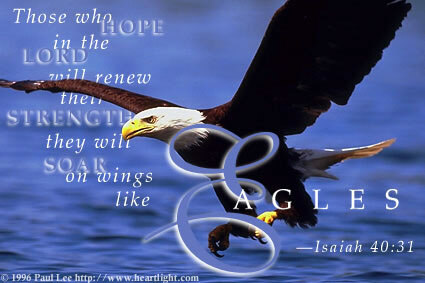 I'm linking up to Judy's Design Wall Monday link box. By the time I'm done, the peaches in the canner will be ready to come out. Stash report and Sunday almost stitching. What an absolutely gorgeous summer day today has been. I think we've had maybe 3 or 4 days like this so far this year, and that's it. A perfect day to spend most of it outdoors in the yard. So, I grabbed my ironing board, and my mini iron, and a bunch of shapes for My Tweets, and starched and pressed under the edges. The ironing board was too high, even on its lowest setting, for sitting in the lawn chair, so I stretched it across the arms of a couple of spare chairs. I've spent most of the day out here, and this is what I've ended up with. Block nine of My Tweets, almost fully prepped and glue basted. There is a smaller set of petals to go on top of the dark pink one in the middle at the top of the piece, and then all the flower center circles, the birds' top knots and beaks. This will keep me happily hand stitching for weeks. I'd forgotten how much I enjoy this process. This isn't the only thing I've been up to, though. Remember how I said I didn't want to start anything new, that I wanted to finish a few more things? We all knew that wasn't going to last. I really wanted to do the Road to Brenham quilt along, so I started that. But, it really isn't that big of a time commitment. Judy gives really small bits at a time to work on. These are my bits, so far. I'm caught up, and waiting for tomorrow's instructions. I'll be canning tomatoes tomorrow, so I figure I can sew while the jars are in the water bath canner for the 85 minutes needed to process them. And then, just because I've been watching these, mostly Kathy's, (it's all her fault for making hers so cute), I decided to give myself a sewing day for my birthday last week, and I put together the ginger bread men for the Deck-ade the Halls Quilt Along. So much for not starting any new projects. LOL!! What this means, though, is that there has been a bit of a stash reduction. Not a lot, since none of these things, by themselves amounts to much, but it's better than adding to it, so I'm told. At least, that's my story, and I'm sticking to it. Now, come next week might be another story altogether, since Gail is hosting another fabric party on Thursday. Balance: 66.75 more yards in than out. I'm linking up with Judy's Stash Report and Kathy's Slow Sunday Stitching and also, on Tuesday when it goes up, I'll link up to A Quilting Readers' Garden. Well, here I am, once again, behind on blogging. There has been a lot going on this past week, but I haven't seemed to be able to make the time to write about it. So, I'm going to take a few minutes here and get caught up. I am really excited about this first quilt. It is my own design, called NINE IN THE POND. This quilt here was done from that pattern by Charlene. This is actually a quilt that I designed several years ago, while I was a member of an online swapping group. We’d swapped nine patches, and I needed a design to use them in. This was the result. And, if you look over to the right hand side bar, there is a pattern available for purchase, in either print or PDF version. This is so exciting!! Charlene wanted an all over design that would highlight the contrast between the light and dark sections of the design. When she dropped it off, we discussed feathers, maybe a wreath or something, in each of the areas. However, after looking at it for a while, I came up with an idea that would be continuous across the quilt, that was not only more economical for Charlene, but much easier to do, without a lot of ends to tie and bury. It's much easier to see in this photo to the left of the backing. Then I did up this wall hanging for her, which is a design from Edyta Sitar. I've never done pebbles as a background fill before, but all the circles in the applique were quite vocal about wanting circles in the background to keep them company, and who am I to argue. And this one is the result of a workshop she did with Kaffe Fasset a year or so ago. It was so much fun to see her bring this one in because it is so not her style or colours. She wanted to take the workshop so that she could stretch herself, and do something outside of her box. I think she was very successful in her goal. I quilted a very large scale overall flower to complement the scale of the fabrics. Because this quilt, and the fabrics are so outside of what she normally uses, she wanted to use them all up in the same project, so the picture to the left here shows how she pieced her backing. Very modern art looking, I think. Thanks, Charlene. These were fun to work on. I've been working mostly on quilting this week, and also doing some canning, so there hasn't been a lot of stash usage this week. I treated myself to an afternoon of sewing on a new project on Friday, which was the usage that I had. Balance: 69.05 more yards in than out. And today, finally after more than 2 years in a box, I finally found and started working again on My Tweets. I originally put it away before I had my cataract surgery, because I couldn't see well enough to do the fine stitching. Then, I spent all my hand stitching time last year doing the 4 stockings. But this year, I don't really have any reason for not working on it, other than it was packed in a box, and I couldn't find it, which I suppose counts as a good reason. And then there was all that packing and getting a house ready to sell and then all the moving and unpacking stuff. I had to go through a lot of stuff today before I finally found where I'd put it. I'd forgotten how much I love these squares. This is number 7, so I have 5 more to go. After doing some lovely, relaxing and slow Sunday stitching today, I have one little flower left to do on that bottom stem, and then this one counts as done, and I can start number 8. I'm really pumped, so I just might do that tonight. And all of them might just show up on my wall tomorrow. 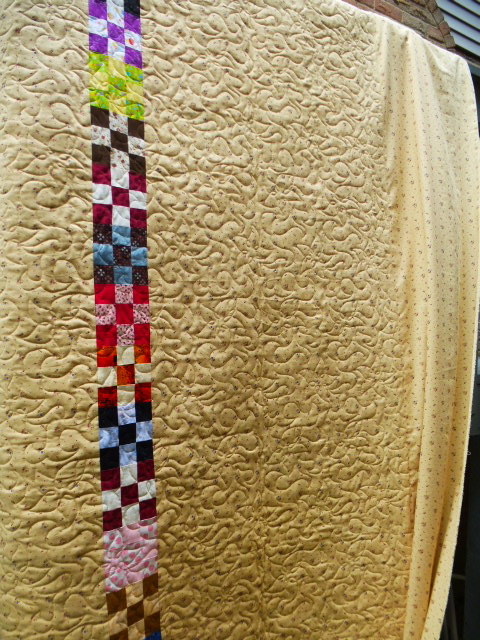 I'm linking up to Judy's Stash Report and Kathy's Sunday Stitching and to the applique linky at A Quilting Reader's Garden. There's lots of fun eye candy over there today. This is the first time in months that I have been able to do a Friday finish post. That's because it's the first time in months that I've actually finished anything. I've started lots of things, but not finished. I'd forgotten the way a finish feels so good. And not only did I finish one quilt, but two!! I can definitely give myself a whoop whoop! The first one here is my Scrappy Dresden Plate. 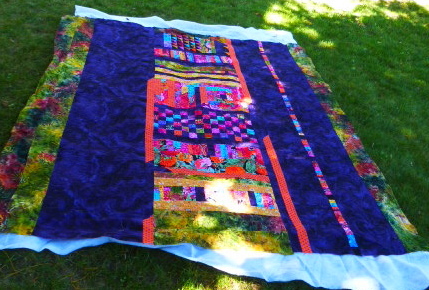 This first picture gives the over all look of the quilt, but doesn't really show the quilting that much. This one, to the left here, shows the quilting a bit better. Here's the back, showing some of the fun feathers that are in all the white background areas and the borders, and also the design that went into the plates themselves. Have I mentioned lately that I love feathers on quilts, and love doing them? And here's a close up of one of the corners, showing the feathers in the background, and the fun striped binding, with the faux piping, which is my go to binding for all my projects. It's fast, and easy, and completely machine finished. And doing the binding on the Dresden Plate is the reason I finally got this next one finished. It's a Disappearing Nine Patch, that has been quilted and waiting for its binding for months. And the binding was even made months ago, just never put onto it. I figured that, since I already had the walking foot on my machine, it was the perfect time to get this one done. 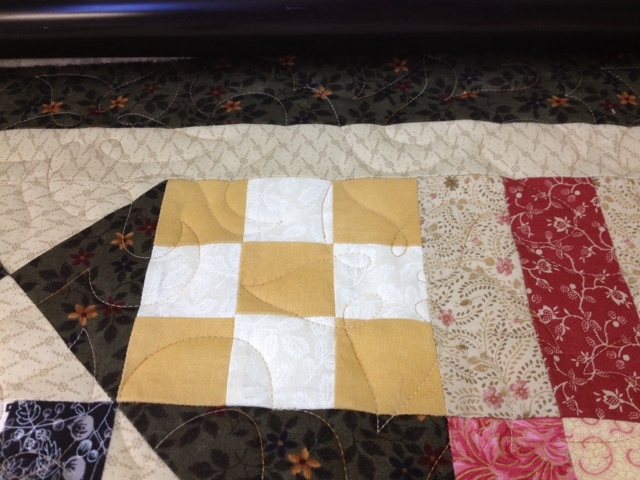 It was quilted with wavy lines going across the diagonal of all the pieces. And, once again, completely machine bound with a diagonally printed stripe with the faux piping. I'm celebrating these finishes by linking up to Crazy Mom Quilts who hosts a weekly Finish it up Friday, and to Confessions of a Fabric Addict who hosts the weekly Can I Get a Whoop Whoop. I've had a few quilts go home in the last few weeks, and I thought I'd take a few minutes now to show some pictures of them. This first one belongs to Helen. This is the first time I've worked with Helen, and it was a lovely opportunity. This is a gorgeous quilt, and it's too bad that the sun was shining on the top of the quilt and washed out the colours there. 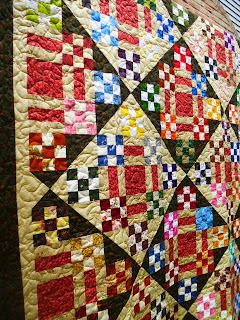 This quilt is full of fun and happy scrappy goodness, and TONS of triangles. 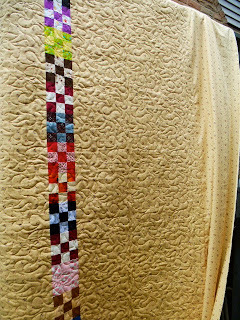 Helen wanted a simple stipple over the quilt so that the piecing and all the fabulous colours would take center stage. This picture below shows the quilting and the colours much better. This quilt is Maureen's. The guild did a nine patch swap and a mystery quilt coordinated with that swap last year, and this is Maureen's version. She used lovely civil war type colours in hers, and it gives it such richness and depth. There are small 5 petalled flowers in her dark fabrics, so we decided on a pantograph design that had five petalled flowers in it. 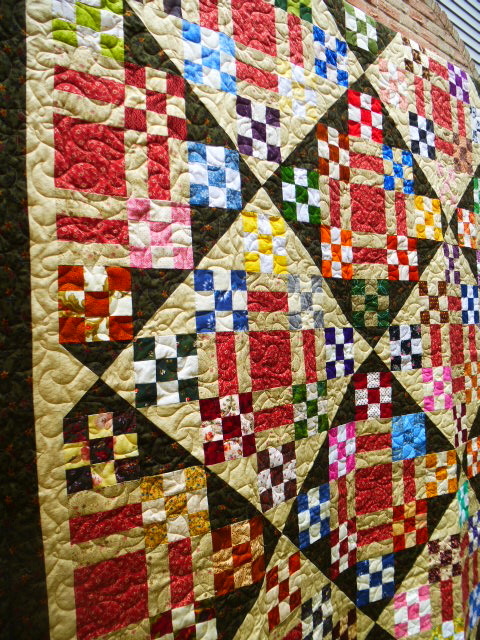 The quilting design is quite subtle, and allows all the colours and contrasts in the design to be the focus. She put her extra nine patches from the swap into the backing. I'm working on Charlene's mystery quilt, done through the guild last year. She wanted something to emphasize the contrast between the light and dark sections of the design. So I'm doing a flowing feather that will, I hope, show up as looking off set when it is all done. Lots of stuff going on here today. I finished my Grandmother's choice quilt last night, and put it up on the wall to see what the final product looks like. I like it. So now, it goes onto the pile waiting to be quilted. Then, I wanted to see what Meteor Shower looks like, now that I have a few more blocks made. There are 13 of these squares to do. Another one that I really liking the way it looks. 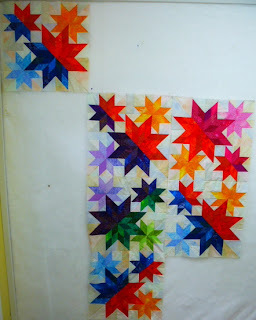 This is on my getting it done list for August, to get a couple more of the blocks done. And then, I just had to put up some of the blocks and sashing for the Lazy Sunday Mystery, just to see what it looks like. I love it!! I so want to start sewing this one together. But first, I finish sewing the binding on my Dresden Plates. I'm trying really hard to finish things, rather than bumping from one thing to another. Although, I've bumped from on thing to another today on the wall, similar to what's going on in my mind. So many things I want to get done, but none of them get done if I keep bouncing from one project to another.I must develop some self discipline....... yeah right...... like that's going to happen. LOL! I'm linking up to Judy's Design Wall Monday, and then I'm going to start in on that binding. The latest issue of Quiltmaker came out a couple of days ago, with the final installment of the Lazy Sunday Mystery, and I had to pick one up so I could see the final result. I love it! I got out all my fabrics yesterday and cut everything I need to get it finished. So there are more subtractions from the stash, including some of the neutrals that were in my last very large fabric delivery. Good thing I got them, because I'd used up most of what I had getting this mystery quilt to the stage it is at. Balance: 69.45 more yards in than out. I've done some slow stitching today, too. It's a perfect day for sitting outside and enjoying the sun. In fact, when the sun goes behind the clouds, it's almost too cool out. This is my second to last block for the Grandmother's Choice block of the week. I've been doing hand applique for this one, and there are only 2 of the blue leaves left, and I can call this one done. The last block was posted yesterday, and I have it halfway done. This might actually be a finished quilt this week. Woohoo!! I'm linking up to Judy's Stash Report and Kathy's Slow Sunday Stitching. And now, I'm going to finish up this block, and the next, and maybe sew the whole thing together. I loaded Maureen's Nine Patch Mystery Quilt this afternoon and have the first couple of passes done. We chose a floral design with the same shape and number of petals as what is in her fabric. This is a big quilt, so it's going to take a while to get done. I have another pair of socks on my needles. They started out as a pair of toe up socks. But when I got one finished, and tried it on, the foot was too short, and I didn't like the way the toe felt.... go figure. So, I ripped it out and started over with the pattern that I originally learned. I had great plans for today. I was going to do up a whole pile of peach chutney, and I was going to get Maureen's Mystery quilt loaded and started. As usual, I rather overestimated what I'd be able to do in one day. We went out this morning and picked up a box of peaches for $9.00. They were considered seconds, since they has marks on them, and were smaller than what could be sold in the regular baskets. But, since I was planning on peeling them and cooking them, it didn't much matter. They were semi-free stone peaches, so they were supposed to be easy to cut and quarter. Well, I wouldn't exactly have called them easy, so it took a lot longer than I thought it would to get them all cut up and ready to cook, like until 3:15 in the afternoon, after starting at 12:30. I used this recipe, except I left out the orange. It took until 6:30 to get it all cooked down. All that work, and all that time, and I got 4 1/2 pints of peach chutney. We had some of it for supper with our ham.... it is soooooo good, and worth all the time and effort it took to make it. During that time I was able to get the binding for my Dresden Plate all made and ready to be sewn to the quilt. Then, it was time for dinner and then cleaning up after dinner. The chutney had used about 2/3 of the peaches, so I've spent the rest of the evening, until sitting down here, blanching and peeling and quartering and pureeing the rest of the peaches, which are going to get cooked on low over night in the slow cooker for peach butter, instructions here. So, tomorrow the peach butter will get put in the jars and water bathed, and then I'll load Maureen's quilt. I'm linking up with Judy's On the Needles, and then I'm going to put the foot of my recliner up, put a movie on, and knit. Now is the time to look back at July and assess just how much of what I wanted to get done actually got done. Then I get to make a list for August. 1. Grandmother's Choice... catch up and keep up. This one is a bit of yes and no. I have 40 blocks done. I have decided that I'm only making 42 blocks, rather than the 49 for the full sized quilt. Mine is going to be a quilt for the couch, so a quilt that is 6 blocks wide, by 7 long will be big enough. Therefore, I will call this one as accomplished. 2. Figure out a design for quilting my Dresden Plate. This one is done, and beyond, since the quilting is almost finished. I had wanted to try something different on this one, but no matter what design I looked at, the quilt told me that it wanted feathers, so I didn't argue. 3. Start the Deckade the Halls quilt along. Nope, didn't do it, mostly because I decided that I need to focus on getting some quilts done before starting anything new. 4. Finish Step 3 of Lazy Sunday Mystery, which is done. 1. Do up the last 2 Grandmother's Choice blocks for my quilt, and get it all sewn together. 2. 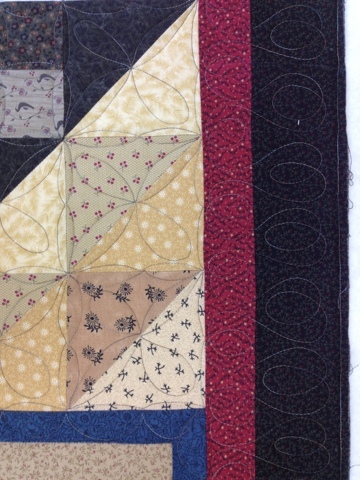 Finished quilting Dresden Plate and get the binding made and sewn on. 3. Finish Lazy Sunday Mystery. I've seen the photo of the finished quilt, and I love it! 4. Finish large blocks for Meteor Shower. I'm linking up to Judy's Getting it Done for August post.